The left liberal frauds are at it again. But this is nothing new. Since 2002, these mega stars of our social circle are violently flogging a horse going by the name secularism. Idea is to invent ways and means to castigate Modi by any means. Every happening or mishappening has to be duly relegated to one of Modi’s faults. If the stories dry out, they manufacture stories from their thick figment of imagination. Our media which is an active part of this fraud congregation propels it further. The likes of Arnav Goswami, Rajdeep Sardesai and Brakha Dutt hold hour long debates to trash this one single man. The interesting part is; none of these three flag bearers of journalistic ethos and values ever care to do their homework called fact checking before outraging and asking others to outrage. One such manufactured instance is the recent farce at IIT Madras, which was beautifully carved and crafted by these frauds. Desperation is evident and as usual, there is a complete absence of any fact checking. So the farce first. There is a student’s group called Ambedkar-Periyar Study Circle (APSC) in IIT Madras. Nobody knows when it was formed and why it was formed or for that matter what they do as a group. But that is not the point of debate here but interesting nonetheless. Another interesting point is the guidelines of student bodies that UGC has formulated and if this particular group APSC follows the guidelines or not. Purists might term IIT as an autonomous body and hence can have their independent rules and guidelines and the argument is taken. Even in that way, none till now was sure or cross checked if this particular group follows those independent guidelines of IIT Madras or not. We never checked hence the group blossomed and now we find they were in gross violation of the guidelines of the institute. We will get to that little later. But first – why this particular group is in loggerheads with the IIT Madras management. This group and their activities best known to them circulated a pamphlet as shown here. For the benefit of the readers, the text of the pamphlet is extracted on the right. Now closely mark the highlighted block. 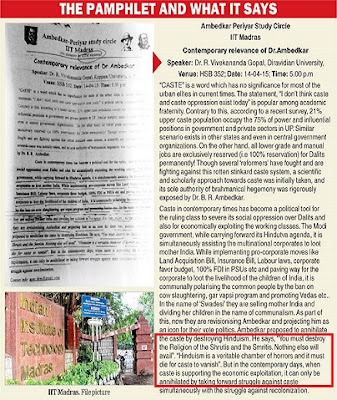 Though there is no evidence to suggest if Ambedkar really said that the Hindu religion must be destroyed in order to curtail the casteism in India, this group took it on their own to docket Ambedkar’s name with something that could very well be their own point of view. In a religiously fragile nation like ours where tempers brew for any damn thing surrounding religion, shouldn’t these faggots be 100% sure while distributing such insinuating diatribe? Have they? I am sure they haven’t because none that I could find to establish if Ambedkar did say so, nor anyone else. Some anonymous letter reached MHRD office complaining such misinformation and that too under the banner of a reputed institute like IIT Madras. The group is then banned for various reasons, which we will discuss in detail. Since then, the group along with its rowdy members are agitating against the IIT Madras management and asking for an unconditional lifting of the ban and an apology from the dean. Seriously? Let’s see how this whole issue pans out. How about starting with the name of the group itself? Talk about oxymoron and you can’t find a better one than Ambedkar and Periyar appearing side by side. Periyar, keeping aside all his fervent qualities, was still a hater of humanity, not just Hindus. This also includes the Dalits and the recently found Maha-Dalits. Not only was his pathological hate for Hindus but also Periyar’s hate for the nation is worth a point to note. At some point he used to run a periodical called ‘Dravidan’. 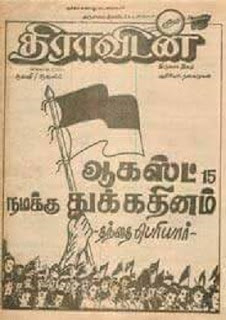 For those who don’t understand Tamil – the inscribed text on this particular edition’s cover page says: August 15th 1947 is a black day for us. Great assessment of our freedom struggle, I must say!! How someone who says our independence day is a black day for him can be associated with someone like Ambedkar? What kind of a group it is that studies and supports views of both Ambedkar and Periyar? That is like someone studying and supporting the views of both Mahatma Gandhi and Osama Bin Laden. Not only this, there are ample evidence to suggest Periyar was a person who hate everything under the sun except his own wretched views of nation, nationality and social coherence. If this group which claims to support and study Periyar’s views, at no point can tolerate the pluralistic views of Ambedkar and vice-a-versa. The father of our constitution can’t be tagged along with a rascal like Periyar who even found our independence a black chapter in our history. So the group’s name sounds like a big farce to begin with. In want of a better logic, I can only see acceptability as the sole reason in bringing Ambedkar’s name as an afterthought. And looking at the kind of bile this group can deliver, it only suggests that their core ideology is to side with whatever retches worthy Pariyar stood for. Poor Ambedkar has to be tagged in so that the bucolic intentions of the group doesn’t become too obvious. Now for those who are seeing freedom of expression getting muzzled by the ban. And by the way, I am not yet talking about the logic behind MHRD’s intervention. We will get to that as well but after some time. So back to FoE. When someone publishes unverified and absurdly schematic self-assertion as the thoughts of a national icon, doesn’t it call for rebuttal? Will these free speech messiahs tolerate if a group in the name of FoE publishes that, once even Pundit Nehru accepted that the Muslims are a hindrance to national growth and national harmony? If no, then why be lenient on something which Ambedkar may not have said at all? This is just part of my argument. Now, will the same free speech messiahs lie quite if I say – for world peace Islam as a religion that must be wiped out? No again? Even though it sounds more logical than the fake statements of Ambedkar? Why? Isn’t it my FoE as well? Will these frauds cry wolf if the authorities come calling on me for jeopardizing the social harmony? I am sure they won’t but that is not my concern. My concern is then why these selfsame frauds are lining up to defend these bigots who have formed this group with a core motto of supreme hatred for Hindus? As far as I know, FoE has certain limitations and one of them is not to incite violence with your despicable free speech. And who feels that this group hasn’t hurt the sentiments of the Hindus by calling their religion worth being eradicated? If yours haven’t then I can’t help much but I find my feelings deeply hurt and I will be filing an FIR and a court case against these jokers very soon. Now, let’s go to the reason how these buffoons came to IIT at the first place. For reasons known to none there is a department of Humanities And Social Sciences at IIT Madras. Though it is one of the oldest departments at the institute, I still struggle to find the usability of a non-technical discipline in an institute that was specifically created for Technical And Research brilliance. If that was not enough, the said department came up with a course on MA English from 2006. Heavens!! What an integrated 5 years course on English and literature doing in a technical institute? Wasn’t the traditional commie breading ground called Jawaharlal Nehru University enough to destroy the sanity of our alma maters that we had to induct similar courses in our technical institutes? And by the way, and you can check it, none of the students who are part of that clown of a group called APSC or agitating at present are from the technical stream. Each one of them is a student of either HSS or this integrated MA English course. And, I am saying this with confidence because I received at least three E-Mails from IIT engineering students (perhaps regular visitors of my blog) who authenticated the fact that this group is a hobnobbing platform for all the nuisance makers of IIT Madras campus. Too much of free time for nonsense, I guess. The interesting part isn’t over yet. The head of this course Mr. Sudhir Chella Rajan and his live-in partner/wife Sujatha Byravan have made sure that absolute garbage gets flushed into IIT through this backdoor. Why I took the names of these two astute human beings here? Search for Sudhir Chella Rajan and his frequent globetrotting to deliver goodies about commies and socialism. In fact, this man was a simple associate professor at IIT prior to his sudden elevation as HoD. Here are the wrapped facts. The then UPA government, presumably after adequate arm-twisting by CPI(M) agreed to this new course in 2006. Since DMK are equal offenders when it comes to Hindus, the implementation was never objected at state level. Surprisingly, ignoring everything including seniority and caliber, Sudhir Chella Rajan was catapulted to the HoD post of this new department. The most experienced among the lot Mr. Milind Brahme is still (last I checked three weeks back) an associate professor while Chella Rajan was first promoted to Professor and then the HoD, even though he joined IIT far later than Mr. Brahme. Masters paying the slave for his good work? I am not taking names here; at least two IIT board/advisory members left their posts in disgust post the introduction of this course and Chella Rajan’s appointment. You can search for the same again. If that is not enough, all faculty members of these two departments are handpicked by Chella Rajan and almost all of them are Christians, Marxists or the routine Feminists that we see loitering around Lutyens Delhi scotch circuit. Systematically, in about a decade, Chella Rajan and his masters with patronage from UPA destroyed everything including whatever was left Hindu in IIT Madras. Remember the ‘Kiss And Love’ protest in November 2014? 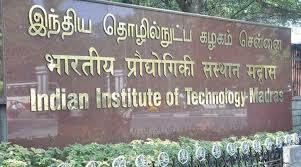 Each one in that protesting group was from this worthless and useless department of IIT Madras. If I believe my readers with respect to their mails to me, this group is rapidly turning out to be a big irritant in the campus. The once vibrant technical institute has now become a hotbed for political maneuvers with these clowns getting down to their worst of political affiliation. People who are not even worth to look at the campus are today merrymaking and creating ruckus inside and that too officially. Why such goons should be tolerated and on what logic? Why sanctity of a great institution like IIT Madras shouldn't be preserved, even if that means kicking out these worthless lurches? Why the snake oil called secularism or misused FoE becomes important over the reputation of an institution like IIT Madras? Can these ayatollahs of secularism and free speech please clarify to me? Coming to the intervention of MHRD and the necessity of the same. Frankly, IIT being an autonomous body, MHRD should have stayed away from it. But is it that simple to conclude? Here is the reason, why they should in fact intervene. The students and ex-students from technical stream, who are/were there solely for quality education, feel the institute is on a downhill since the introduction of this MA English course in 2006. I believe them since; Commies are the ones who have destroyed everything they lay their hands on. So IIT Madras can’t be a rare exception. If steps aren’t taken then soon IIT Madras would be another Anna University or JNU or Presidency College or Jamia Milia Ishlamia, where there is nothing left to take home on education and intellectual brilliance but politics and politics alone. Even Delhi University is quite near in achieving the same rotten stature. And I don’t see a reason why shouldn’t the MHRD intervene to stop IIT Madras from getting ruined. After all, these institutes are run on public money and all should be interested about the wellbeing of the institute. Even if we forget money for a second, there are very few things that we have achieved and can call world class after independence and we should protect them by any means so that these commies don’t usurp them with pleasure. Second, by inciting violence through their non-verified scripture these jokers have crossed the boundary of FoE and it calls on the state to take these rascals to task. After all, they are culprits of our law and that should be good enough. And by the way, if Ambedkar has really said as is claimed by this worthless group then he should also be brought to task as well. Being the father of our constitution he must be doubly sincere in protecting the guidelines he himself came up with. FoE has limitations and it is Ambedkar who must know in better terms than most of us. Every instance involving these commies that i have been following in the last few years reinforces what my Manager said. Sitaram Yechury immediately springs to my mind whenever I think of above 3 qualities. These all liberal, sikular and presstitute are proven anti national. BC, we are so lucky to have bjp government in india. today they are teaching our students to do YOGA, tomorrow they will teach us sholakas and make us priests irrespective of castes. will they ???? Forcing yoga is communal....alright?? What about going to gym? Not communal right? Just like Educational Institutions run by minorities are exempted from being part of Right to Education (reserving some percentage of seats in privates schools for economically backward; religious minority institutions are exempted from doing this), the non Hindu boys/ girls may be exempted from attending yoga classes if they certify that they are going to Gym. My idea may look funny; but I am surprised nobody gave this Idea to minority leaders. When minorities in India have always found ways to sidestep laws in the name of attack (they call it attack when it might just be a pinprick or even less) to their religious sentiments, why unnecessarily be alarmist and look to prevent something that is good. Let Hindu children get benefited from it at least. they themselves believe in) can make them do it. History has shown it time and again. Hence the sarcasm in your lines looks unwarranted.